Windows Users : Windows PC has no default software that supports SSH / Telnet. Most uses PuTTY named free application for the purpose. Linux User : Linux is Unix Like Operating System, your Terminal will work fine for the purpose. Mac User : Mac is full UNIX now, The default UNIX shell in Mac OS X Panther (10.3) or later is Bash, Terminal is a program included with all versions of Mac OS X. It is located in the Utilities folder within the Applications folder. iTerm2 is also a widely used application. For Git, usually Git specific softwares are available from the official websites. On Linux (Debian and Derivatives like Ubuntu), official websites supplies the needed command to install and use Git from Terminal itself. For Windows a separate Git Bash is used, supplied as installable exe software. We need to remote login to the remote computer, where unless other softwares installed, there is no graphical user interface like your desktop, unless you configure as VNC Desktop. That is however has issues and not conventional way. On git you can not do it. 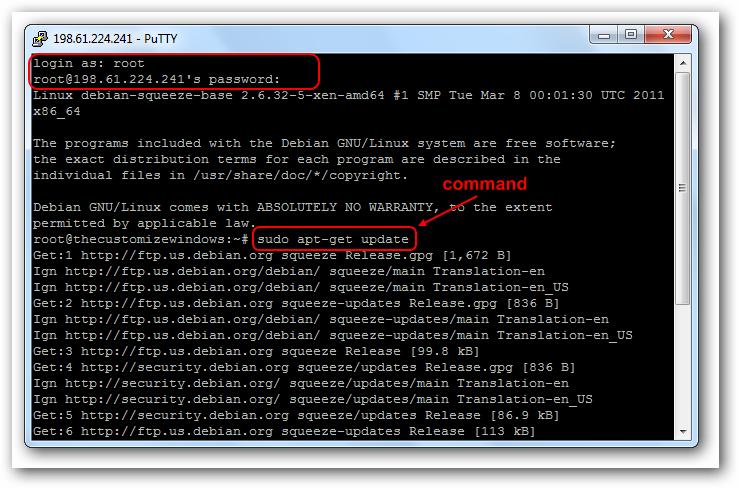 Windows PC : Download PuTYY for Shell access and Git specific softwares for Git. We have full guide for PuTTY. Username is usually root and IP is server’s IP. This Article Has Been Shared 5548 Times! Cite this article as: Abhishek Ghosh, "How To Get Access Via Command Line Tool for Cloud Servers and Git," in The Customize Windows, November 7, 2012, April 26, 2019, https://thecustomizewindows.com/2012/11/how-to-get-access-via-command-line-tool-for-cloud-servers-and-git/.